If we want to get at history from below, where do we start looking? Traditionally social historians, at least of medieval and early modern Europe, have relied upon two kinds of records to recover the ‘voices’ of those people who did not deliberately create a lot of records themselves. The first kind is court records and other legal documents such as wills and inventories, contracts, and so on. Because many people encountered the legal machinery of the state in which they lived (which included, for much of European history, the church as well), and because states have tended to hold onto these documents, this is one place where we can catch traces and glimpses of our elusive subjects. The second is printed material, especially the printed material which circulated amongst the people ‘below’, such as pamphlets, newspapers, or ballads. Of course, neither of these sources offers a perspective that is uncomplicatedly ‘from below’. Law courts are usually dominated and directed by elites. Publications were often censored and may have repeated official as well as popular attitudes. We have to take account of these issues – but I have never really liked the simple above/below distinction too much anyway, and I think it is entirely possible that, in these sources, if we use them carefully, we can find the ‘voices’ of people from all directions. If we use them carefully. Some of the conversation at the Birkbeck workshop questioned how to use these sources, and especially compared the two. It was suggested that there has been, and still is, a habit of seeing print as ‘soft’ and legal sources as ‘hard’. There are some basic reasons for this – legal documents present technical challenges such as knowledge of the relevant law, difficult palaeography, and perhaps language barriers. English court records were often written in Latin, for example. One point made at the workshop, though, is that printed sources are just as technical as legal sources if used carefully. All sorts of circumstances surrounding printed texts should be considered, including publisher, edition, location, price, and the physical characteristics of the printed object. I wonder if this original distinction has also been reinforced by our digital age; more published sources have been made available online, and court records online tend to focus on the most accessible (i.e. fairly easy handwriting, in a language many people understand). So, to some extent, as has been discussed elsewhere on this blog, that distinction or distortion has been replicated and multiplied by modern technology. I think everybody at the workshop agreed that to chase those ‘voices’ we need to practice with great care, which includes being aware not only of our sources, but of the medium through which we access them. Another, related topic was the approaches we choose. Social historians have often been quite anecdotal in their use of evidence. As E. P. Thompson put it in his wonderful Customs in Common (1991): ‘We commence with impressions: we ornament our hunches with elegant or apt quotations; we end with impressions’ (p. 24). Thompson himself was guilty of argument by ‘elegant or apt quotations’. At the workshop, Edward Taylor suggested we be more openly systematic, in a way more statistical, with our anecdotes, looking across many different collections of sources to see how ‘resonant’ certain ideas were. By more rigorous investigation we could locate those anecdotes in their wider cultural setting. One objection to this might be that the evidence we have is not itself systematic, or that we don’t understand that system, so imposing our own system might be disingenuous. I am sympathetic to Ed’s point, though. I feel that because this is the only evidence we have, we should make all possible use of it through different forms of analysis. You never know what interesting results could crop up. In this discussion, one word which came up again and again, and to me captures nicely the central issue of ‘history from below’, was fragments. All we have are the fragments of the past, and while this is true of most history, the evidence is even more fragmentary when you are dealing with social groups who were illiterate or for whatever other reasons did not record their experiences for posterity. Or even if they did, that evidence may not have survived. Quite a lot of letters probably ended up as toilet paper. This brings me to the ‘future’ side of my title. I read, not long after the workshop, that the six UK deposit libraries now have the right to collect electronic as well as published books. At the moment, I believe, this is mostly e-books, but ‘the libraries [are] also working to archive the entire UK web domain’, and it raises all sorts of questions similar to those we face when we look at our fragmentary evidence. Which online material will be selected and stored? Does the nature of it being online change it: are we in fact losing as well as gaining something? I like to illustrate this with the problem of correspondence. Will we, in the future, publish collections of emails instead of collections of letters? (Who owns the legal rights to email accounts anyway?) Aren’t emails, to steal shamelessly from Shakespeare, ‘too unadvised, too sudden;/Too like the lightning’ (lines 124-5)? Did the physical effort of writing a letter, or typing it on a typewriter, render its contents somehow more meaningful? I suspect it did. If you knew that a letter would take weeks or months to arrive, or might never arrive at all, to someone you only spoke with through letters, I think you made sure that what you wrote was worth reading. Obviously there are exceptions. Plenty of seemingly mundane letters survive. I still think the point holds, though. The act of creation, and to a lesser extent survival, confers meaning on our sources, communicates the meaning from their creator or their archiver. If everything is easy to create, and everything survives, how are we to critically pick out what has meaning and what doesn’t? Another way of looking at this is a conversation I’ve often had with friends – usually over a pint – along the lines of ‘wouldn’t it be nice if facebook existed for the seventeenth century?’ Just think of the evidence there! Social relations, topics of popular conversation, self-representation, visual sources… And yet I’m not always convinced. These developments in modern technology force us to look back and think again about our fragments from the past. What a lot of social historians, historians ‘from below’, are trying to do is recover the everyday conditions of life in the past. Would these conditions be so fascinating if we had them at our fingertips? Isn’t the jigsaw puzzle of reconstructing these conditions out of fragments part of what makes it so interesting, at least for us researchers? I guess the crucial question is how much of a part? I don’t know, but it is worth thinking about. This entry was posted in Theory and methods and tagged history from below event, the craft by manyheadedmonster. Bookmark the permalink. I think this issue of sources, and their accessibility, is crucial for thinking about the fortunes of ‘history from below’ as a topic of research. I’m still of two minds about the current waves of digitisation. I agree that much of the digitisation that has gone on, such as EBBO and ECCO, may actually privilege sources that can tell us much more about the elite or the literate middling sort than about the illiterate majority, especially women and the labouring poor. Yet, looking back at the past historiographical trends, perhaps we shouldn’t be so sceptical. After all, my impression is that part of the strength of the first wave of ‘history from below’ came from the fact that this was the period when county record offices were being established all over England, making it much easier for young researchers to dive into judicial material and parish records. If that’s the case, perhaps the latest expansion of archival ‘infrastructure’ – viz. digitisation – will actually spur a new generation of historians to leap into ‘history from below’. The obvious examples of the Old Bailey Online and London Lives are very amenable to social history, but so too are new initiatives like the Marine Lives project. So, although I share your worries about an imbalance in the types of sources accessible, I still see reasons for optimism. I never got the opportunity to follow an academic vocation – but I have found the democratic technology of the internet a way to come from down under – working-class obstacles/distance of Australia to family history research – my HERstory is unravelling and sparking the imagination, history of homeland and contexts can be found at the touch of a button. I find academics like yourselves thinking and writing about the same things but via a different route – cheers! Forgive me, Brodie, but I do not think your observations about County Record Office are correct. Such offices existed before the Second World War and received the bulk of their accessions before 1960. ‘History from below’, moreover, is not just a product of the inspiration of former members of the Communist Party’s group of historians. It had many springs – from the work of W.G.Hoskins and Mildred Campbell, of Peter Laslett and the Cambridge Group on the History of Population, and, later, from the work of Alan Macfarlane, John Walter and Keith Wrightson amongst many others. Fair points, Christopher. I don’t want to derail the conversation from Richard’s main issues, so I’ll be brief. On the country ROs, my claim that they were being established in the post-war period is based on my reading/hearing this from a source I can no longer recall, so I’m probably just misrembering. Perhaps this is when they were expanding and cataloguing? I’d be interested to hear more (from you or from anyone else) about the chronology of the establishment and expansion of the county archives as I think it must have historiographical implications. On your second point, I completely agree that there were many people doing something similar to ‘history from below’ long before the CPHG. Yet, as will be discussed further in this symposium, social history (by, e.g., Hoskins, Campbell, Laslett, etc.) is not quite the same as ‘history from below’. As far as I know, that label and its ideological aims were a product of the 1960s. Interestingly, the first relevant hit on JSTOR seems to be a review essay by Charles Tilly in 1964. Perhaps it’s not even a British term! 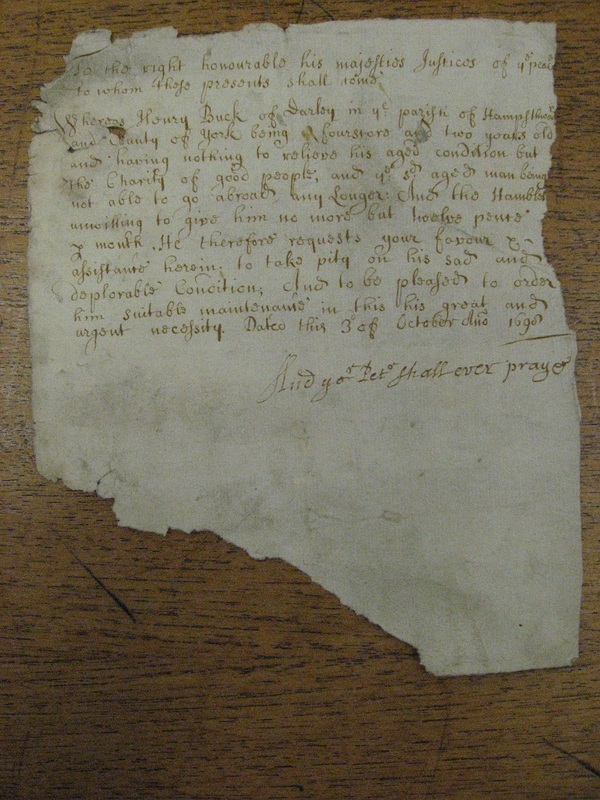 Thanks, Christopher, for the thoughtful post on your early encounters with record offices at your Early Modern History blog. Some very interesting recollections. I’m envious of your meeting F.G. Emmison: his published work is very impressive. I think Edward Taylor’s idea is a good one. I did something like that for my book with indemnity petitions from SP 24, classifying them by what kind of arguments and evidence people used to claim indemnity. There’s even more scope for doing this kind on thing with compounding petitions. There are still some limitations. Petitions have to be written to appeal to the elite and conform to systems that the elite made, so they tell us more about what ordinary people believed the elite wanted to hear than about what ordinary people believed was right. I’ve found lots of people taking advantage of Parliament’s indemnity system despite no apparent allegiance to Parliament, but that’s an interesting point in itself: committees didn’t necessarily expect enthusiastic allegiance. The other problem is that quantifying petitions still relies on subjective interpretation of the text. Interpreting meanings can’t be done scientifically. Maybe digital techniques like compression clustering, topic modelling and ‘sentiment analysis’ could help to automate the process, but I’m suspicious of anything that blurs Shannon’s distinction between information and meaning. I’ve just realised that if Edward’s idea is taken to a logical extreme, it’s basically memetics. That may or may not be a good idea, depending on your point of view. The earliest reference to ‘history from below’ known to me comes from The Times Literary Supplement in the mid-1960s and was a sub-editor’s heading to a review or set of reviews. Yes, the TLS article was E. P. Thompson, “History from Below,” Times Literary Supplement, 7 April 1966, 279-80. That seems to be when it began to become popular, but it apparently had a French origin (Georges Lefebvre, ‘histoire d’en bas’, 1930s) and was, as mentioned above, used in English by Tilly in 1964. There’s an interesting thread on H-Net that talks about it. Thanks for the great discussion! Although I know nothing about the foundation of county record offices, I do agree with Brodie that the accessibility online of records that allow us even to approach a history from below (keeping in mind their elite filters) is likely to encourage new generations of scholars to pursue these topics. I think this especially true for folks not based in the UK. I’m not sure how it works elsewhere, but in the States, upper level undergrads and many masters students don’t have the funding to travel to extra-local archives. The online source repositories are invaluable to enabling them to put together solid, source-based research projects that, one hopes, pique their interest in trying to understand the lives of the lower classes. Even if they never go on to pursue further studies, perhaps they’ll learn to look at things differently and be more sensitive to class injustice in their own societies. On the topic of collecting all of the internet communications – whew! It seems like there’s a fair amount of junk out there, but it’s tough to say what will be of use to future scholars. Maybe someday someone will catalogue all the responses that include the words “cool” and/or “awesome” and be able to tell us something about the evolution of language (as an admitted over-user of both of these words, I am prepared that that something may not be flattering). I suppose my main concern is that the sheer amount of data will be overwhelming. I already suspect that the internet has given us breadth at the expense of depth, and it seems like this trend is only going to continue. Anyway, thanks again for the discussion! Although Wahrman is not interested in ‘history from below’ the article is a lively read and contains, I think, a lot of potential for thinking about ‘fragmentary’ sources, and doing more with them than creating ‘impressionistic’ conclusions – or what Wahrman calls ‘weak collages’. I’d certainly recommend it to those thinking about fragments of evidence. Thanks for all the comments, especially Mark for mentioning the Wahrman article; I forgot to ask Ed the details. I generally agree with the optimism about opportunities offered by online collections – not only for new generations of historians, but also for bringing primary sources outside of academic research. I am intrigued by the possibility of crowdsourcing projects, so that digitization does not simply allow non-academics to see sources, but helps to build communities and networks of people, academic and otherwise, interested in what we can learn about the past. As to a ‘more systematic’ social history, naturally there are problems with any methodology, but I think the best way to look at it is the need for experimental approaches. A more rigorous attempt to find broader resonances beyond simply collecting anecdotes might not yield eye-opening results, but then again it might well, and there’s only one way to find out! Otherwise, have we really moved on much from the foundations Thompson (and others) laid?